LOGAN SQUARE — Acrobats could soon be swinging from the ceiling of a century-old Logan Square church. A circus school is attempting to buy the 107-year-old Logan Square church with hopes of turning it into circus training center. Aloft Loft, a space for all things circus arts, has a contract to buy First Evangelical Church at the corner of Kimball and Wrightwood avenues. The founder of the company, which trains performers for high-flying productions such as Cirque du Soleil, envisions the building will become the world's center of the performance art. "Chicago is sort of becoming a home and mecca for the contemporary circus movement," said Aloft's founder, 38-year-old Logan Square resident Shayna Swanson. The church was listed for sale, 3324 W Wrightwood Ave., in February for $1.3 million. Swanson said her company, which she founded 10 years ago, had planned to stay in its current home at 2000 W. Fulton St. on the Near West Side, but was unable to renew a lease there. Aloft hopes to move into the church and be up and running by November. Representatives from the church, could not be reached for comment Thursday. Swanson said the church is moving to a location southwest of Logan Square, but did not have further information. Once Aloft learned it was not going to be able to renew its lease, the organization began looking for a new place to host its 250 students and immediately found the listing for the church. The church and its high ceilings are perfect for a circus training site, according to Swanson, and a move-in should be relatively painless. "I walked into the main sanctuary and got tears in my eyes and thought, 'This is the most perfect place we will find,'" Swanson said. Aloft claims it beat out a number of real estate developers who were attempting to turn the church into condos. "Every time I see a church get turned into condos I'm like, 'No!'" Swanson said. "It could be something so cool." Aloft, which trains performers to create "the circus shows of tomorrow," launched a crowdfunding campaign to help transform the church into a circus center. The circus company is seeking to raise $100,000. • $35,000 would go toward rigging the 107-year-old church to make it safe for trapeze and other flying acrobatics. • $15,000 would go toward removing a tin false ceiling in the church. • $20,000 would go toward leveling the floor, which is sloped from front to back for maximum church-viewing. • $15,000 would renovate two apartments in the basement of the church, which the circus company would use to house students for a full-time training program. • $7,000 would help obtain a zoning change to make the circus school legal in the building. • $8,000 would support additional renovations. As of Thursday night Aloft had raised more than $8,600 with 59 days left in its fundraising campaign. Aloft currently has 16 full-time students and 250 recreational students and hopes to expand programming at the church location. Students from all over the country comes to the unique school. “Sometimes when people hear 'circus' they get really nervous and think of carnies and crazy clowns, but the type of circus that we do is much more based in the artistic element and modern dance," Swanson said. 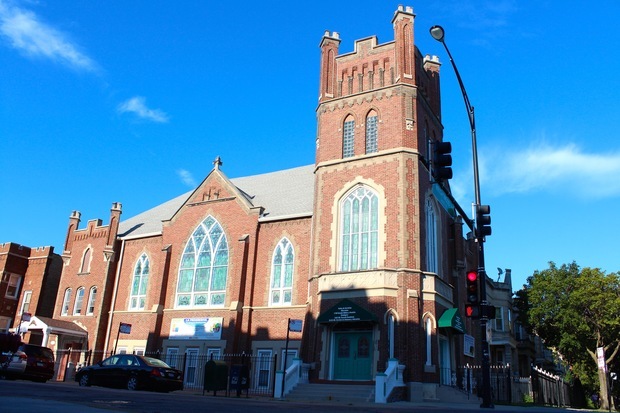 An earlier version of this story incorrectly stated the church for sale was the Grace United Methodist Church of Logan Square.